The Rangers, in borrowed armor from the League's armory, first visit the UN with Wonder Woman, then join the fight against Zedd and Brainiac's forces around the world. Batman reboots Cyborg, much to Superman's chagrin, as he disproves of Batman's methods. Superman returns the rest of the Power Coins to the remaining Rangers, and then rescues Alpha-5 from Brainiac. We end with Alpha-5 making a surprise leap into battle as he grows to the size of the monsters Zedd and Brainiac have created, and begins an attack of his own. Story - 3: I remember enjoying the last issue a fair bit, but sadly with this issue, I was left very much underwhelmed. Maybe it's because my interest in the series is waning due to its solicitation schedule, but I felt this issue to be quite the "filler". This really felt like nothing more than padding to be honest. Maybe this series could have worked with 4 issues with more page count rather than 6. I liked the bickering that went on between Superman and Batman over his rebooting of Cyborg, and the twist at the end of Alpha-5 growing to giant size to battle the monsters. Other than that, it was just filler. Even the opening scene with Wonder Woman at the UN meeting was underwhelming. Art - 3: Steven Byrne does another decent job on the art and coloring with this issue. I think the color work is what saved this issue for him mostly, as this issue featured Superman a fair bit, but he has very inconsistent looking facials throughout. Byrne can capture emotion in his/her facial expressions well, it's what he excels at with most of the core characters. But the Superman panels were a bit of a let-down. In one panel he actually looks angry at batman, but the dialogue doesn't match. Maybe that's an editing issue, I'm not sure. It was still fun to see the Rangers dressed up as characters from the DCU, from the Prometheus Helmut to the Earth 2 Lex armor by Grant Morrison. And the obvious animated series influence with the Yellow Ranger in Hawkgirl's helmet. I really hate to criticize another artist work this way, being a graphic designer and having done my share of illustration work, I always try to look at what the artist was trying to bring to the issue. I just feel, that with this series, maybe Byrne is/was having trouble keeping up with his deadlines. 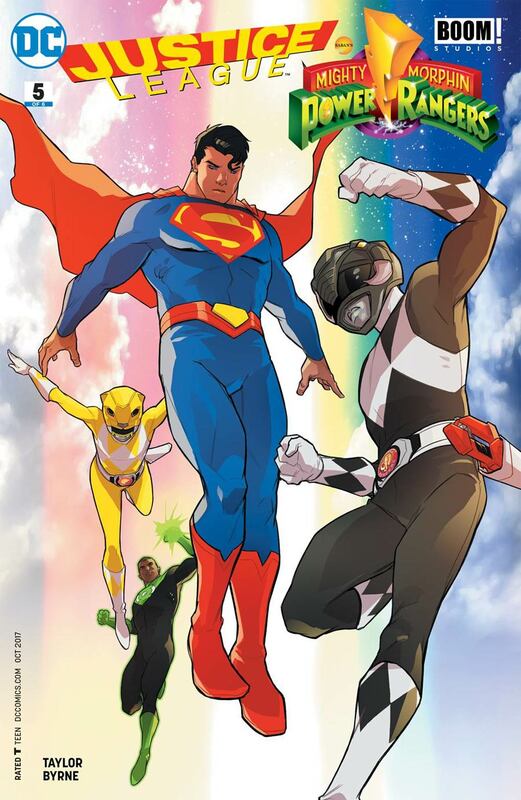 Cover Art - 4: Karl Kershl's cover features two of my favorite characters, Superman and JS Green Lantern. Only thing is Superman's arms look really awkward. Sadly I don't think Karl captured the POV really well, otherwise it's a great cover.